What is causing the polio-like illness? Is it enterovirus D68? Is it some other virus? What could it be? Are vaccines causing this polio-like illness? Glad you ask. It’s not a virus causing the paralysis, it’s the state of health and immune function of the individual. The Wild Doc said it. The CDC confirmed it. We are dealing with an ever deteriorating state of societal health and watching conditions caused by immune dysfunction devastate of children and the entire country! 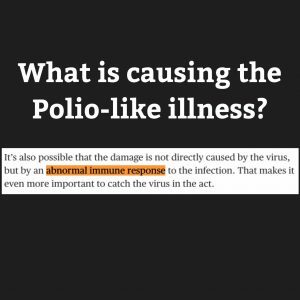 We have to stop and say if what we are seeing is more people with an auto-immune disease, more children with neurological health problems and more paralysis than ever before… how can we just keep doing more of the same thing… Vaccines CAUSE IMMUNE DYSREGULATION!